LLN: lower limit of normality; ULN: upper limit of normality; VC: vital capacity; TLC: total lung capacity; FRC: functional residual capacity; IC: inspiratory capacity; RV: residual volume; ERV: expiratory reserve volume; FEV1: forced expiratory volume in 1 s; FVC: forced vital capacity; PEF: peak expiratory flow; FEFx%: forced expiratory flow measured after x% of the FVC has been exhaled. 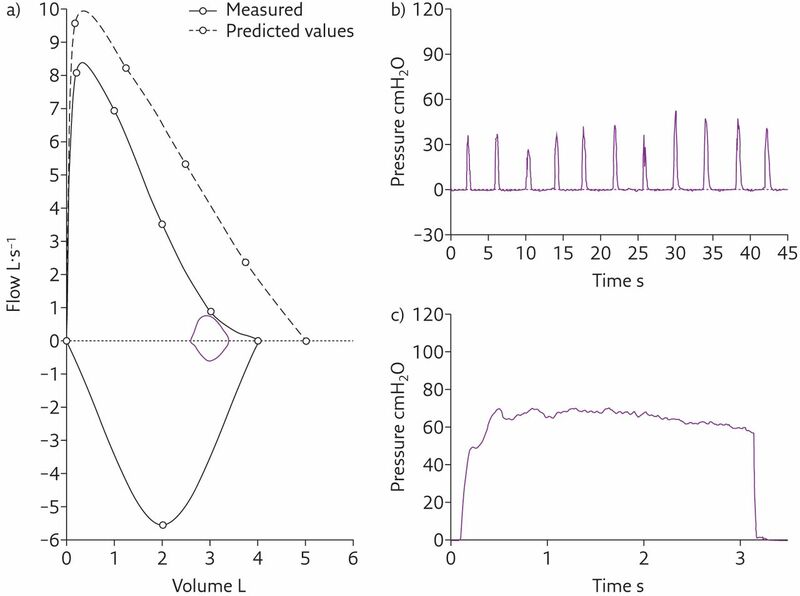 #: spirometric evidence of an obstructive ventilatory defect as defined by a reduced FEV1/VC ratio less than the fifth percentile of the predicted value . MIP: maximal inspiratory pressure; MEP: maximal expiratory pressure; SNIP: sniff nasal inspiratory pressure. #: reference values taken from [2, 3]. RME: respiratory muscles evaluation. Please refer to the text for more details.